Lawyers for the rapper, whose real name is Andre Young, filed a notice of settlement in a Los Angeles federal court. He had been expected to give evidence during the week-long trial, which would have decided whether Dre was entitled to 100 per cent of the profits from online sales of the rap album, which also helped launch the career of Snoop Dogg. No details of the settlement, which is not yet finalised, were filed with the court. In April a judge ruled that WIDEawake Death Row Records didn't have the proper permission to sell Dre's music online or repackage it on new CD releases. The label purchased the holdings of original Death Row Records, which launched the careers of several rappers, out of bankruptcy. He sued WIDEawake Death Row in 2010 for breach of contract, trademark infringement and misappropriation of his likeness. 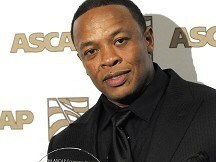 Dre was a co-founder of the label, but negotiated a deal to leave the company that required Death Row to obtain his permission before selling his music digitally. On Monday, The Chronic was no longer available for download on Apple's popular music service iTunes.